Product prices and availability are accurate as of 2019-04-22 02:19:35 EDT and are subject to change. Any price and availability information displayed on http://www.amazon.com/ at the time of purchase will apply to the purchase of this product. 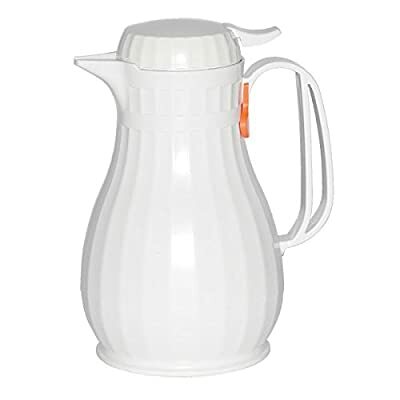 Eco-Serv Server, 1.3 Liter (44 Oz. ), Retention: 2-3 Hours, Thumb Operated With Lid, Abs Insulation-Foam, Styrenic Resin, Snap-On Decaf Indicator, Dishwasher Safe, White, (Must Order By Case Pack Of 12 Ea. ), Dimensions: 9 3/4"" X 5"" Replacement Parts: Lids, Benefit From A Reliable Plastic Server That Is Versatile Enough For Nearly Any Application: Restaurants, Hospitals, Board Rooms, And More. Snap-On Decaf Indicator; (Ft1Or - Id Orange/Decaf For Eco Series).